Posted on Wednesday, May 23rd, 2012 at 6:17 pm. I’m very pleased to make available for free download a series of small group studies centred around the theme “The Hands of Jesus and our hands”. Accompanying the Study Booklet are six sermons, useful for preachers who wish to use the theme for a preaching series while their congregation uses the studies in small groups. The content is licensed like the rest of this website under the generous Creative Commons Attribution-Noncommercial 3.0 Unported License. 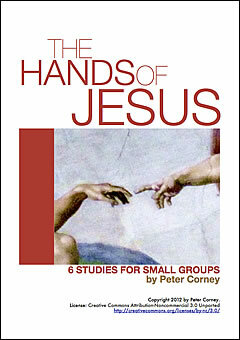 They can be used as small group study material and or combined with a sermon series; there are six accompanying sermons available for free download at http://petercorney.com. They could also be used for individual personal reflections. The Bible text is from the NIV translation. The core material of the study and Bible passages. A thought for the week. As we read the life of Jesus in the Gospels and his interactions with people one of the things that is not immediately obvious is the way he uses his hands, but when you focus on it, it is striking and suggestive. Often when he heals the sick he touches them. Although Jesus doesn’t need to touch in order to heal he often does. With his hands he washes dirty feet, he breaks and serves bread, and he cooks fish and hands it around to his disciples. He takes children into his arms and places his hands on them in blessing, and on the cross his hands are cruelly pierced. In our imagination we can also easily see Jesus warmly embracing his friends, clasping a shoulder or hand in affection or encouragement, waving a greeting or a farewell, emphasizing a point as he teaches, holding out his open hands in prayer to his Father. They are hands that are used to hard work, they are tradesman’s hands. Jesus the divine son of God is also fully human and so like us he used his hands to communicate, to express himself, to convey feelings; empathy, encouragement, support, love, friendship. Because we use them constantly it is easy to forget how important and significant our hands are, only when we injure a finger or our hand and can not use them do we realize how much we rely on them. But they are not only critically useful to us in all our everyday tasks they are also part of our “language”, our means of expression. Our hands are used to convey a great range of messages and emotions. They are used for greetings and farewells, to express friendship, affection and love, to show praise and anger. We point in accusation, we shake a fist in anger, and we clap in appreciation and congratulation. As disciples of Jesus we are called to follow him, he is our teacher, guide and model for the way we should live. In one of his conversations with the disciples after his resurrection and shortly before he was to leave them in body he said “As the Father has sent me so I send you”. We are now to be Jesus’ hands in the world! In these six studies we are going to focus on the way Jesus used his hands and what they tell us about the way we should live and act as his disciples. Posted on Sunday, July 24th, 2011 at 1:45 pm. When I was a theological student there was a preacher we used to call ‘Chloroform’, which calls for no explanation! Then there was ‘Springboard’ who announced his text and then dived into a series of ideas that bore only the remotest connection to the text. But thankfully there have also been many faithful, excellent and exciting preachers that I have learned from. So from years of listening to sermons and working hard to produce them myself what do I think makes a good sermon? 1. The right attitude: Unless you believe that there can be no greater privilege and responsibility than speaking, teaching, explaining and applying Gods word to people’s lives then don’t do it. 2. Solid preparation: Haddon Robinson says that “Every time you preach someone suffers – either you suffer in preparation or the hearers suffer!” Preparation in prayer, in study of the text, in research, in the construction of the sermon is non negotiable. My average when I was preaching weekly was about 12 hours per sermon. 3. Grounded in God’s Word: Jesus said “We do not live by bread alone but by every word that proceeds from the mouth of God” All preaching whether expository or topical must be from the scriptures, we are ministers of The Word. The preacher’s primary task is to understand what the text means and how it applies to the life of the people and his own life. The systematic exposition of the Word of God is the spiritual bread of the Church. The various ways of approaching this we will comment on in point eight. 4. Christ centered: Of course not every text mentions Christ specifically but the preacher should always have in mind the central theme of the bible – God’s grace to us in the saving work of Christ. The preacher must consider how this theme comes to bear on all exposition and every human need. This is the frame that sets every passage and topic in its right perspective. Scripture is a unity and its revelation ultimately has a singular focus – Christ. 5. A commitment to intelligent orthodoxy: In a culture hostile to the Christian faith there is a tendency in the contemporary church to “conformism”- the radical adapting and reducing of creedal Christianity to fit the prevailing plausibility structure – what people find believable today. At the other extreme is the reaction of fundamentalism. What is desperately required is intelligent orthodoxy where thoughtful preaching engages the current intellectual idols and challenges and critiques them with the historic faith. This requires reading, study and hard thinking. 6. Delivered from deep conviction: The Bishop of Dublin in the late 18th C said to his clergy “Preach, not because you have to say something, but because you have something to say.” It is very clear to the listeners when a preacher speaks out of deep conviction and when they are just going through the motions. One is compelling the other induces apathy. Conviction can come with a quiet intensity or a forthright passion, both are arresting. If you have nothing to say then please don’t inflict it on us! 7. Application to peoples’ lives: A sermon without practical application is like being given a new task without being given any instructions in how to do it, very frustrating! Sermons that exhort or inform but have no application to peoples lives eventually have a de motivating effect. If you regularly exhort me to pray but don’t give me any practical tools or guidance in how to pray more effectively the exhortations begin to wash over me. In application the questions we need to answer as preachers are: How does this teaching affect my life, my work, my relationships? How do I respond to this now and next week? If this is true what transaction do I need to make with God this morning? (b) Start where people are. Start with their issues, questions, needs, challenges. The Jewish psychotherapist Irvin D Yalom lists four universal challenges that all of us face at some time in our lives. He calls them the ‘Existence pains.’ First: The inevitability of death for each of us and those we love. Second: The freedom to make our lives as we will. Third: Relationships and our ultimate aloneness as individuals. Fourth: The absence of any obvious meaning or sense to life. Around these four areas cluster most of our inner concerns and anxieties as we try to cope with the harsh facts of life. They echo the book of Ecclesiastes. The preacher must use illustration, example, metaphor and story to aid understanding. Research on listeners’ attention shows marked jumps when a story is introduced. It also jumps up when personal experience and appropriate humor is introduced. Part of the answer is to ‘speak visually’, to tell stories, to use visual media where possible and to not avoid emotion. Bret Whitley once said that “painting is a struggle between form and content”. The same could be said of preaching, but without that struggle there is no great preaching as there is no great art. The preacher’s primary task is to help the listeners ‘hear’ Gods Word to them, but ‘hearing’ involves more than making peoples’ eardrums move! Why is some evangelical preaching boring? Posted on Saturday, April 16th, 2011 at 11:31 am. Evangelicals have rightly always placed a high priority on preaching and in particular expository preaching, the expounding and explaining of the Bible. We do so because we believe in the authority of the Word of God for our belief and practice – for our life. We believe that it is the spiritual food of the people of God. As Jesus said, “We do not live by bread alone but by every word that proceeds from the mouth of God.” (We have seen what happens to churches that have been starved of its food, when Biblical preaching and teaching has been downgraded; their emaciated bodies are waiting for the body bags.) We believe that it is powerful and as the instrument of the Spirit of God can change and reshape us. But out of our convictions and concerns there has developed among some evangelicals a style of expository preaching that is frankly boring! It is boring because it often lacks application to people’s lives and so, unintentionally, is not nourishing. It often sounds like little more than a reiteration of the text with some minor and obvious commentary. It’s a bit like having the Bible reading again with some explanatory notes. (a) A conviction that believes that the scriptures will do their own work of application to the hearers without too much human interference. All the preacher must do is study them carefully in preparation, explain their plain meaning and pray. This high respect for the text fears that too much comment by the preacher will detract, distract or deviate from its message. (b) There is also a fear that too much attention to creative application and cultural relevance will overpower the plain meaning of the text or at worst distort it by amplifying the preachers own concerns and preoccupations or infect it with the preachers imagination. Now there is substance to these concerns. We have all sat through sermons that used the text as a springboard to dive into a pool of ideas only vaguely related to the meaning of the text. Some of us have listened to preachers who had read somewhere that Karl Barth said the preacher should have the Bible in one hand and the newspaper in the other, except that there always seemed more attention was paid to the Murdoch news than the Good News! We have probably all experienced the Entertainer, where the sermon is a collection of anecdotes strung together with a series of jokes and seasoned with a text or two. Some of us have had the misfortune of sitting under preachers of a very liberal theological persuasion whose attitude to the text was that it was an interesting religious resource to be dipped into for the odd quotation, or alternatively, to be the subject of detailed deconstruction or demythologizing. This really is stones for bread. So evangelicals are right to be concerned and cautious about preaching that departs from the text or places the focus somewhere else. Nevertheless preaching that does not apply the text to life is not evangelical preaching either and it will not feed the people of God nor challenge the enquirer. (1) The text and its priority. The preacher’s first task is to approach the text with great respect and prepare thoroughly through prayer and study to understand what it means. (2) To explain that meaning clearly. This will often require developing illustrations, metaphors and examples. This will require imagination and creative thought. (3) To ask and answer the question; how does this apply to our lives now? What does it mean for the way we are to believe, live, think and act today and tomorrow? (5) The cultural context. All preaching takes place in a particular culture at a particular time by an enculturated person to a group of enculturated people. It is never culturally neutral. The preacher must ask themselves; who are the listeners? The closer the language, idiom, humor and culture of the speaker to those of their listeners the greater will be the attention, understanding, learning and acceptance. The greater the distance the greater will be the loss of attention and the failure to accept, understand and learn. (This is obvious with ethnically different groups when the cultures and languages are radically different, but it is also true between the sub cultures of a shared dominant culture. eg; the difference between a person from a well off private school background who has a university education and a job and lives in Kew and someone from a low income family who didn’t finish high school, has been unemployed for two years and lives in Dandenong. These differences also exist between age cohorts of people in the same overall culture.) Preaching, like publishing the scriptures into a new language, is an exercise in translation, the greater the differences between the preacher and the listeners the more challenging is the process of translation. (6) Communication skills. The preacher must ask themselves; why will people listen? Why will they pay attention? Even when the culture of preacher and listeners is similar it does not guarantee communication! Unless preachers understand the basics of communication they will fail to gain a hearing. Gifted preachers have an intuitive feel for this but all preachers can learn the basics and greatly improve the hearing of the Word of God. Relevant application is an important issue here. Inductive Preaching – Helping People Listen.By Ralph L Lewis and Gregg Lewis Crossway Books 1983. Preaching to a Post Modern World. By Graham Johnston Published by Baker Books 2001. © 2014 PeterCorney.com – Foundations | Perspectives on the Christian Culture & Faith. Reuse is licensed under Creative Commons Attribution-Noncommercial 3.0 Unported License.